LASIK and PRK are both laser vision correction procedures that can help you achieve clear vision without glasses or contacts. The difference is that in LASIK, a flap is created in the cornea to allow reshaping of the cornea’s interior, while in PRK the reshaping of the cornea is performed on the surface. PRK was the first form of laser vision correction to get widespread use. In PRK, the clear outer surface of the cornea, called the epithelium (outermost layer) is gently removed. The interior of the cornea is then reshaped using the VISX Laser. The epithelium grows back, but the interior of the cornea retains its new shape which changes the focusing ability of the cornea so that light is focused directly on the retina as a clear image. In LASIK, the IntraLase Laser is used to create a flap in the cornea and is folded aside. The interior of the cornea is then reshaped without removing the epithelium. The flap is then placed back into position on the reshaped cornea, where it bonds. Both procedures give outstanding vision correction results with about the same high percentage of patients achieving 20/20 vision. LASIK is the most widely used laser vision correction procedure because it has many advantages over PRK. The main advantage of LASIK is that the results are almost immediate. Most people achieve, or are very close, to their final results the following day. 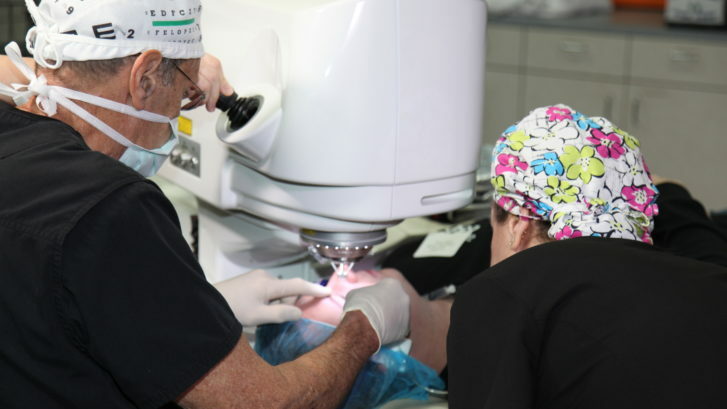 Because PRK removes the epithelium, PRK patients don’t usually experience this level of improved vision until the epithelium grows back which can take up to two weeks. Another significant advantage of LASIK is that there is much less discomfort postoperatively than PRK. Because nerves that transmit pain signals are located in the cornea, PRK results in notable discomfort while LASIK patients usually experience minimal discomfort. Also, since the surface layer of the cornea is removed, the remaining cornea needs to be protected, so PRK patients will temporarily wear clear bandage contact lenses to guard their eyes and reduce discomfort. PRK does have advantages over LASIK that make it the right choice for some people. First, because no flap is created in the cornea, it can be performed on people with thinner corneas who are not a good candidate for LASIK. Also, PRK has a lower incident rate of temporary dry eyes, a complication that some people experience after LASIK. People who have clinically significant dry eyes before laser vision correction should consider PRK. During your consultation, we will talk about all procedures and which one is right for you. If you haven’t found what you are looking for, please contact our office at (281) 464-9616 and we will be glad to answer any questions you may have.